Let’s just take a minute for the man, the legend. I know these are strong words but he is more than deserving. His name literally stands for “Ladies Love Cool James” and if you saw his gripping performance on the television sitcom “In the House”, your heart was captured just like mine was. I still remember dancing around my room and listening to B96, lip syncing to his songs with a hairbrush as my microphone. I killed it. Just trust me. It’s been a LONG while since he has come out with another hit but his classics still capture my heart. He is no Rumi or Shakespeare but his words ring true in all aspects of my life. Don’t judge. When I saw THIS bag on the front cover of the Henri Bendel catalog, it gave me all the feels. I immediately took a photo and sent it to my Mom and sister with the caption “Hey Lover”. I knew they would swoon over it just as much as me and recognize that this was more than lust, more than a crush – this was a must-have. I researched it, I went to see it in person, I read reviews, I brainstormed all the many ways I could wear it to justify the price tag, I scoured the internet for promo codes – I was a woman on a mission to bring the package home. Dad – I know this is not how you intended for me to use these words of wisdom but this inspiring saying has so many interpretations! You really should have clarified that it was not meant to encourage me to persistently pursue unbelievable pieces that could transform a wardrobe. Until you clarify, these four words will continue to serve as the mission statement for suddhara.com. You the best. SWOON. If your family and friends aren’t as sneaky as mine, do not fret. Henri Bendel has discount codes for first-time buyers and their holiday promotions are on point. Just like LL Cool J’s beret game. Crushes come and go but true love will last a lifetime. So, will this bag. P.S. 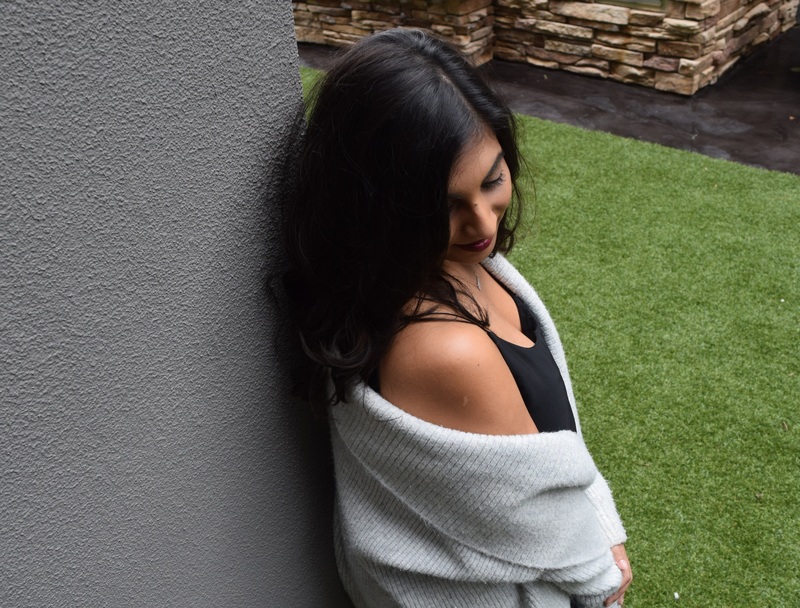 I suppose I should also give a quick shout-out to the tried and true staples in these photos – cozy, oversized cardigans are a MUST HAVE for winter and this one from ASOS is just everything. Every time I put it on, I feel like I am wrapped in a cloud, which is a feeling all of us should experience once. Trust me. This tank is also from ASOS – shocker! If you are looking for flattering yet comfortable basics, this is it. Look no further. Seriously, stop searching. The best part about this outfit is that you can purchase every last thing online while you sip Ovaltine in front of the fireplace – no need to venture out into the cold and brave the holiday crowds to look fresh to death. Always looking out for you.